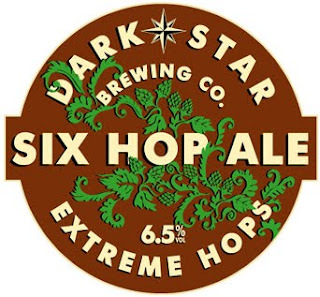 Dark Star's Six Hop is one of the best beers I�ve drunk so far this year, whether in the UK or California, from anywhere in the world, dispensed from the bottle, can, keg or cask. It truly was a stunning glassful, a perfectly hand-pulled cask ale. It�s 6.5%, six-times hopped, a February special from the Sussex brewery. It shines in the glass, one of those pints that�s alive with colour and condition, a crown of frothing bubbles settling above. It�s a full bowl of tropical fruit, grapefruits, oranges and peaches, it�s fresh like spring, floral and grassy, it has hints of sweetness but never too much, the bitterness is bold but not brash, it�s smooth, it�s crisp, it�s dry and quenching yet and mouth-filling and lip-smacking. A complete triumph � if you see it, drink it.